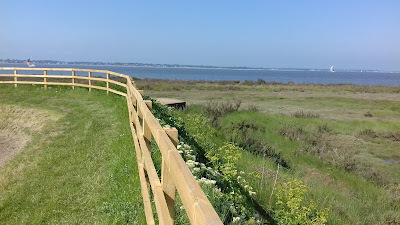 I do a lot of walking along the sea walls around here – they are in fact some of the best places to ramble in agricultural Essex. 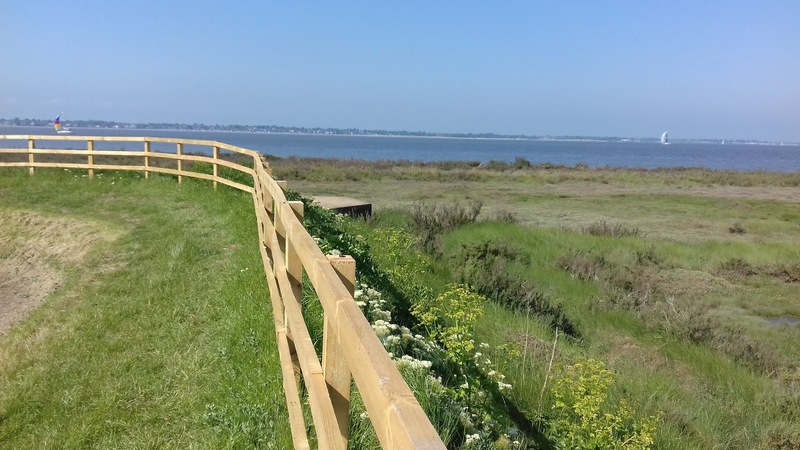 A favoured walk is from St Peter’s Chapel out at the end of the Dengie peninsular, round past Bradwell power station to Bradwell Waterside, there to recuperate with a drink and a bag of nuts in the Green Man, then back to the starting point. In all it’s about 8 miles. While taking this route it’s nice to stray onto the beach for a while, or pause to take in the scenery. 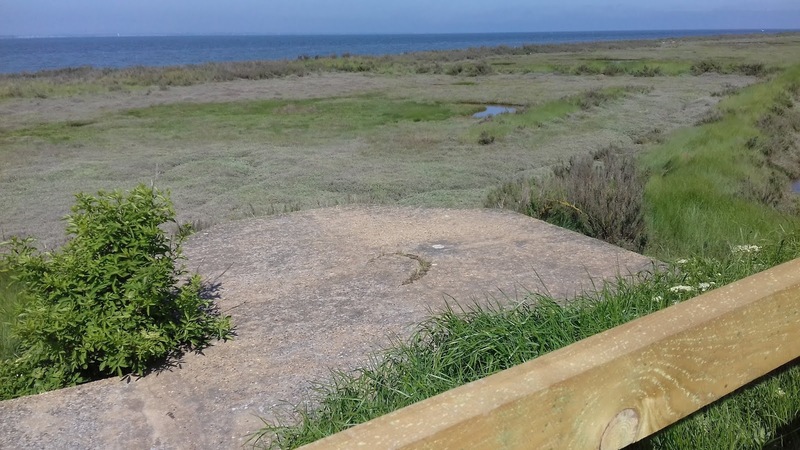 A good place for doing the latter is from the tops of pillboxes (WWII defences) incorporated in the sea wall. They provide a perfect platform. Or, at least, they did. 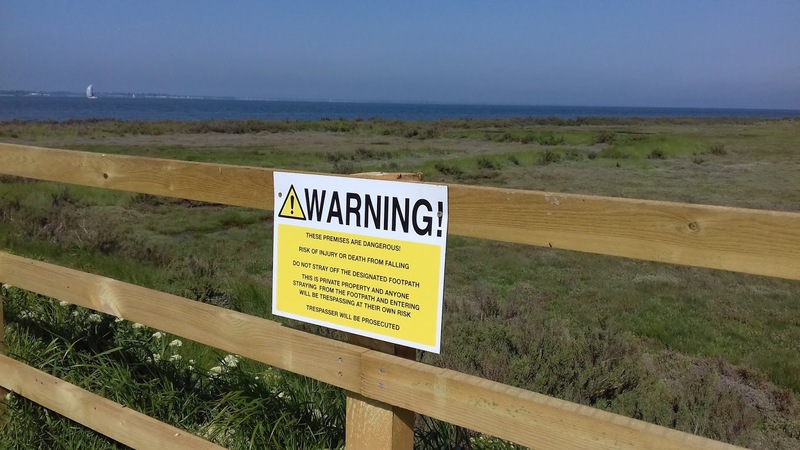 Now it seems the nanny state and the fun police have struck again. Can’t be having us plebs walking out on these things. No safety rails you see. Someone might fall off and instead of this sensibly being seen as a valuable contribution to the Darwin Award, it’s to be frowned on. Of course, the council, or whoever put these fences here, is not entirely to blame. In my childhood, should I have fallen from something like this, my father would have added to my injuries with a clip round the ear for being such a dozy prat. In today’s litigious society, that’s not what happens, and woe betide any council that allows the children of generation snowflake to stray near potential harm. More and more I see the future Britain full of strictly controlled and managed parks, where blobby people can motor along the neat paths on their invalid scooters, and where children bounce along looking like the Marshmallow Man in their safetywear, perhaps pausing to inspect the patches of stinging nettles and thistles growing behind Perspex screens. I haven’t been reading many books over the last few years. I put this down to events of over four years ago when I ceased to take pleasure in anything. By and by my enjoyment of most things has returned but with the reading, not so much. Too often in the last few years I’ve picked up books and then lost interest in them – the whole idea of continuing to read them seeming a chore. I therefore began to think that maybe this was a pleasure that would never return and that, after years of reading books and years of writing the buggers, I’ve become jaded with them. To a certain extent, this may be the case. I’ve found that books I used to love quite often annoy me, especially when I hit continuity errors and other mistakes, and slip into a dispassionate editing mode. Or when I read others and find myself baffled by my earlier enjoyment of them, or when I read a writer whose language I loved and now find just irritating. However, I do still come across books, and writers, who do the job. David Gemmell is one such writer, while Peter Hamilton is another. Recently, while in a bookshop, my girlfriend waved a book at me that for some time I’d been talking about buying and reading. 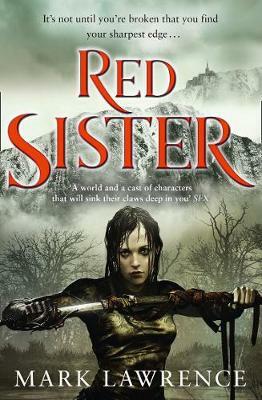 This was Red Sister by Mark Lawrence. 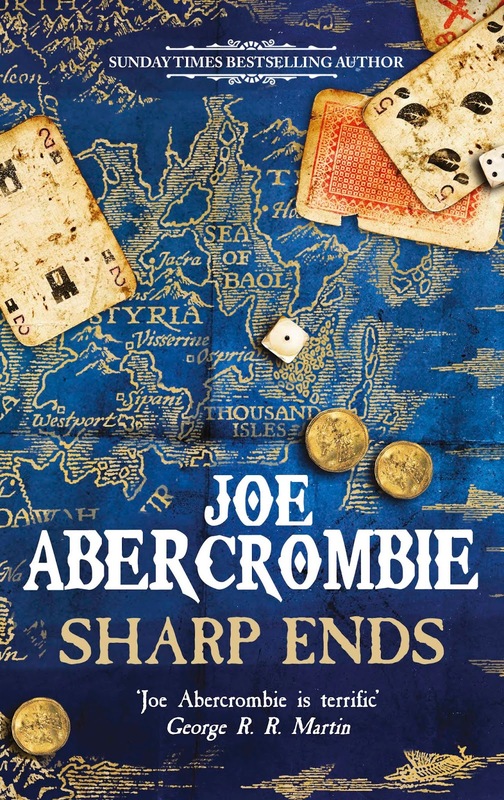 I took that and, while there, noted Joe Abercrombie’s short story collection Sharp Ends, and picked that up too. Incidentally, both of these writers were introduced to me by way of their publishers hawking them around for nice comments to put on the covers. In each case, I had no problem with this. I have ARCs of The Blade Itself by Joe Abercrombie and of Prince of Thorns by Mark Lawrence, and then went on to buy the ensuing books of, respectively, the First Law and the Broken Empire trilogies. Anyway, these two books . . . I polished them both off in under a week. I guess this is the point where I should wax lyrical about the hard gritty fantasy of these two writers with its lack of fluffy elves, and its excellent memorable characters. Perhaps I should mention how unputdownable was Red Sister, or how just a small bit of dialogue between characters in one of the Abercrombie short stories had me snorting tea out of my nose? No, I will not. All I will say is that for this jaded old misery these two books are the good stuff. Gridlinked is in a Kindle 'Start a Series' promotion in the UK for 10 days. Buy it now for 99 pence! I'll be doing a Reddit AMA (ask me anything) at 6PM UK time. Hello people, Neal Asher here. 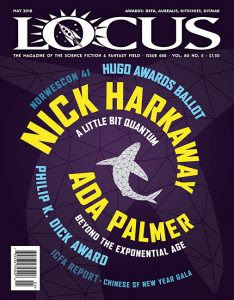 Here are the nuts-and-bolts of who I am, or maybe more correctly, what I do: I once was a hungry aggressive SFF writer struggling to get the odd thing published and writing new stuff on the back of rejection letters. I spent years running at that particular brick wall with my head, until something finally broke . . . I then spent years of getting short stories, novellas and the like published in the small presses (and earning some way below zero for them). A big publisher, Pan Macmillan, finally took me on and brought out my first full-length SF novel, Gridlinked, in 2001. A year or so later I took the risk of giving up my day job and now I’m about 25 books in. Most of my stuff is set in the ‘Polity’ – a far future human/AI society that is pretty utopian, except for the hostile aliens at the border, the occasional psychotic AI, a war that burned up a few hundred worlds and a civilization-destroying alien technology . . . you get the picture. If this is your kind of thing (described as post-cyberpunk space opera, apparently) then search engines will turn up all you need to know. You can find my website at nealasher.co.uk. The blog there is copied across from http://theskinner.blogspot.com while I can also be found on Twitter @nealasher, on Facebook at neal.asher and of course here on Reddit. My latest book, The Soldier, is the first in a new trilogy with the overall title Rise of the Jain. Jain technology is the one mentioned above. You might like to ask me why I named a hostile alien technology after a peace-loving religion and my answer will be suitably glib! This is an AMA so go ahead and ask me anything. I can’t guarantee I’ll answer, or maybe be any more than flippant, but I’ll give it a shot. But I get ahead of myself. The Soldier: Rise of the Jain Book One opens a new set of chapters in the story of the infiltration of Jain technology into the Polity/Prador neighborhood. The story hosts a reunion of characters from earlier books: the Jain-taming haiman (AI-enhanced human) Orlandine; the Jain-spreading creature once called the Legate, now Angel; and one of the ancient, moon-sized, enigma-loving aliens called Dragon. New characters include familiar Asherian types: a couple of Hoopers, nearly-indestructible humans from the everything-eats-everything planet Spatterjay; some disturbingly upgraded and cooperative (if still vicious) Prador; and miscellaneous snarky battle drones and AI warships. They are joined by some even stranger creatures, often singletons of various kinds: relicts and lone survivors, the creation of a rogue AI war­ship, self-redesigned cyborgian entities. 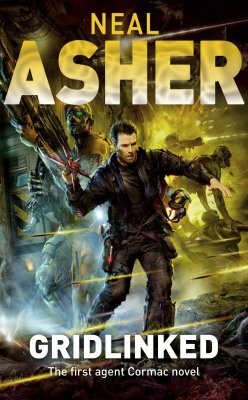 I had thought with the Transformation trilogy (Dark Intelligence, War Factory, Infinity Engine) that Asher had maxed out what could be done with the Polity setting – that the near-metaphysical im­plications of the fate of Penny Royal constituted a kind of narrative event horizon. I think I might have been mistaken.